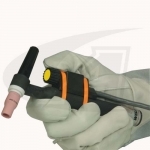 Durable, compact, precision fingertip amperage controls for out-of-position TIG welding. Constructed with high-quality, electronic components with proven, state-of-the-art amperage control technology, these controls are fully self-contained. Never need repairs. Designed to meet the needs of a wide range of welding jobs, these lightweight yet durable, amperage controls feature a compact design for better comfort and increased productivity. A 27' (8.2m) control cable provides greater flexibility and can be readily upgraded to longer cables as needed.